We need to be intentional about helping our children grow as Christians and the summer is the perfect time to make this happen! 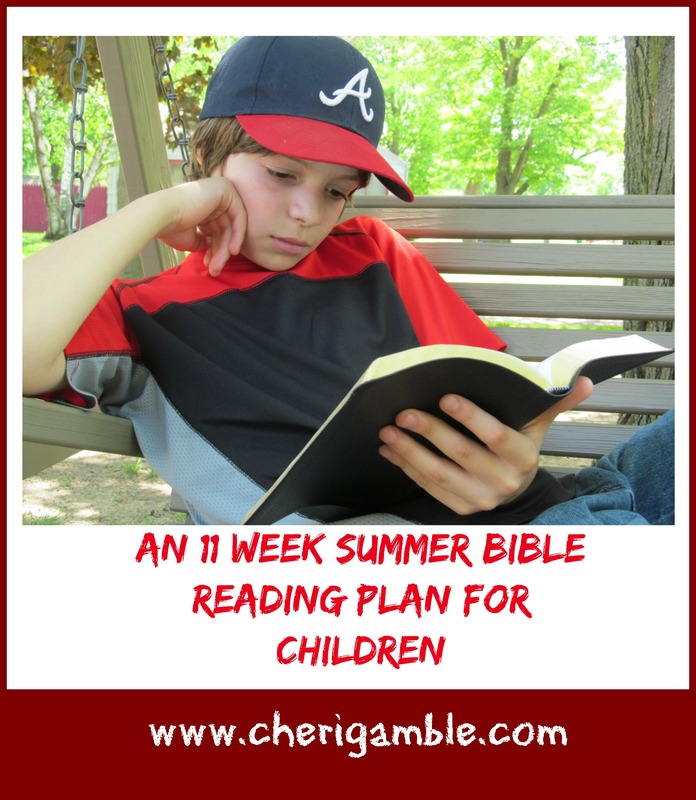 In this post, you will find my summer Bible reading plans for children for 2014. Each week focuses on a different attribute of God and includes a Psalm, an Old Testament and New Testament story, and a reading from an epistle all related to that attribute. The plan for Older Children includes a “Think about it” question after each passage and one or two suggested activities to go along with that week’s Scriptures. The preschooler/younger child plan includes “To do” activities — activities that are designed to be completed with a parent to help explain the Scripture to the child. There is also a facebook group for those of us who are using this plan with our children. 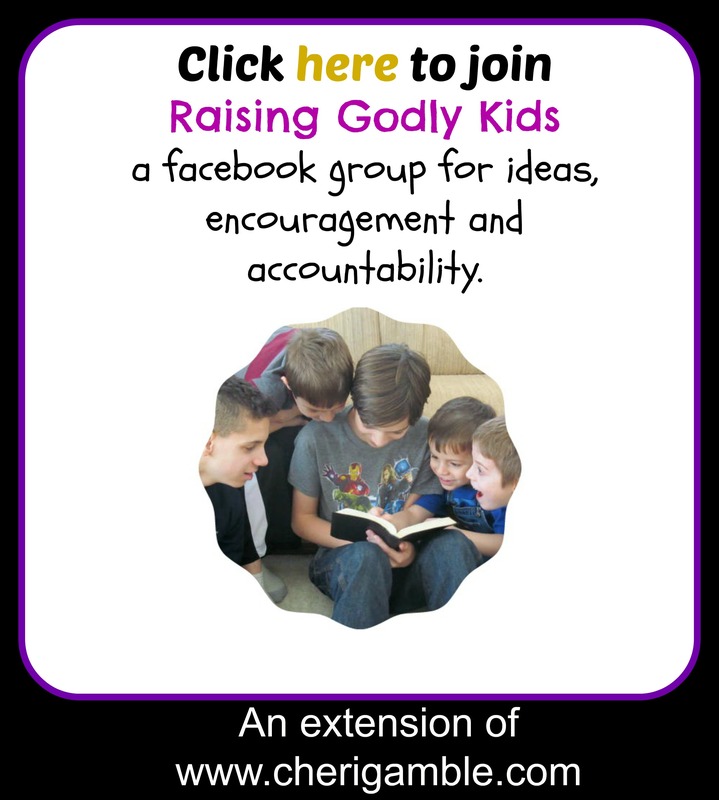 It is a place to share encouragement, ideas, and accountability. Come join us at https://www.facebook.com/groups/1444576505791952/edit/#!/groups/summerbiblereadingplan/. Click on the links below to be taken to the PDF file that you can then print off and use with your child this summer. Or, scroll down and find the entire plan in this post. Whatever you do, be intentional this summer and help your child develop his relationship with Jesus! God is Eternal – He has always existed, and He always will exist! _____ Monday: Read Psalm 90:1-2 and Psalm 93. Think about it: According to these verses, how long has God existed? _____ Tuesday: Read Genesis 1. _____ Wednesday: Read John 1:1-18. _____ Thursday: Read Revelation 4. Think about it: What do the creatures in heaven cry out every day? _____ Friday: Read Revelation 21:1-9 and Revelation 21:22-27. Think about it: What will not be in heaven? Is your name written in the Book of Life? Activities: Take a nature walk and explore God’s creation. Draw a picture of what you think heaven will be like. God is Holy – there is nothing impure or dirty found in Him at all! _____ Monday: Read Psalm 24.
you need to clean out of your heart today? _____ Tuesday: Read Isaiah 6:1-8.
ask Isaiah to do? Is there anything God wants you to do? _____ Wednesday: Read Luke 4:31-37 and Mark 1:21-28. Think about it: What did the demons call Jesus? _____ Thursday: Read Romans 12. _____ Friday: Read 1 Peter 1:13-25. Think about it: What does God want our lives to be? How can we do this? Activity: Find something in your house that is dirty. (Example: your windows). Clean them up until they are as clean as you can get them. Notice, the windows didn’t clean themselves! We also can’t clean ourselves – we need Jesus to clean us and make us spotless! The windows will get dirty again – we also will sin again! Ask Jesus to clean you up every time you sin. He will help you to be holy! God is Faithful – He will not let you down. What He says, He will do! _____ Monday: Read Psalm 89:1-18. Think about it: What should we make known to everyone? How has God been faithful to you? _____ Wednesday: Read Daniel 6. _____ Thursday: Read Luke 22:39-53. Think about it: How was Jesus faithful to His mission? Why is this important to us? _____ Friday: Read 1 John 1.
you need to confess today? Activities: Share with someone how God has been faithful to you. Ask several adults to tell you about how God has been faithful to them. Make a poster of ways you can be faithful to God. Make a commitment and stick with it! God is Omnipotent – He is more powerful than anything or anyone else! _____ Monday: Read Psalm 29. Think about it: What does the voice of the Lord do? _____ Tuesday: Read 1 Kings 18:20-40. Think about it: How did God show his power in this passage? _____ Wednesday: Read Mark 4:35-41. Think about it: How did Jesus show his power? Over what did he have power in this passage? _____ Thursday: Read Mark 5:1-20. _____ Friday: Read Philippians 3. Think about it: What does God have power to do? Activities: Draw a picture or make a comic strip related to one of the events you read about this week. Eat bacon and tell someone about what Jesus did to a bunch of pigs. Watch a fireworks show and discuss God’s power!! God is Omniscient – He knows every single thing! _____ Monday: Read Psalm 139. Think about it: What does God know about you? Read verses 23 & 24 again as a prayer. _____ Tuesday: Read Jeremiah 1:4-10. Think about it: When did God know Jeremiah? Are you willing to obey God’s call on your life? _____ Wednesday: Read Mark 2:1-13. _____ Thursday: Read John 18:1-11. Think about it: What did Jesus know? Did this change anything that he did? _____ Friday: Read Romans 8:26-39. Think about it: How does the Spirit help us? Spend time thanking God that He knows you!! Activities: Look at baby pictures of yourself, or ask your parents to show you your ultrasound picture if they have it. God knew you when you were in your mom! Isn’t that amazing? Draw a heart and write a prayer on it thanking God that He knows you and loves you! God is Loving: He loves YOU and wants you to know that! _____ Monday: Read Psalm 136. _____ Tuesday: Read Jeremiah 31:1-14. Think about it: How long does God’s love last? _____ Wednesday: Read John 13. Think about it: How did Jesus show His love? _____ Thursday: Read 1 John 2:1-17. Think about it: How is the love of God shown in our lives? _____ Friday: Read 1 Corinthians 13.
do YOU need to work on the most? Activities: Write a love letter to God. Sing “Jesus loves me”. Pray for someone you have difficulty loving. God is Merciful: He forgives those who ask, even if they don’t deserve it! _____ Monday: Read Psalm 32. Think about it: What happens when we confess our sins? _____ Tuesday: Read Genesis 8. Think about it: How did God show mercy to Noah and his family? _____ Wednesday: Read Luke 7:36-50. Think about it: What did the woman do? How did Jesus respond to her? _____ Thursday: Read Matthew 18:21-35. Think about it: Who do we need to forgive? How often? Is there anyone you need to forgive? _____ Friday: Read Psalm 51. Think about it: How did David deal with his sin in this Psalm? Activities: Write a prayer thanking God for His mercy. Spray some perfume and think about how Jesus has forgiven you. Act out one of the passages you read this week with some friends. God is Sovereign: He is in complete control over everything and can do whatever He wants! _____ Monday: Read Psalm 46. Think about it: Who is our refuge? Over what does God have control? _____ Tuesday: Read Genesis 11:1-8. _____ Wednesday: Read Matthew 8:1-17. Think about it: How did Jesus show He had complete control? _____ Thursday: Read John 19:1-30. Think about it: Who gave Pilate the authority over Jesus? _____ Friday: Read Philippians 2:1-18. Think about it: What will everyone one day do to Jesus? Activities: Search the paper or internet for current events. Take a big marker (be sure to print out the article first if you use the internet) and write “God is in control” across the article. Even though things seem crazy today, God is still SOVEREIGN and He does have control! One day everyone will see that!!! God is Just: He will not let evil go unpunished! _____ Monday: Read Psalm 9. Think about it: Who will God judge? Do we need to be afraid of God’s judgment? Why not? _____ Tuesday: Read 1 Samuel 3:1-21. Think about it: How did the Lord appear to Samuel? Who did He say He was going to judge? _____ Wednesday: Read Matthew 7. Think about it: Is there someone that you have been judging instead of loving? _____ Thursday: Read Matthew 25:31-46. Think about it: Who is God judging here? How? Which category would you fall into? _____ Friday: Read Romans 14. Think about it: Are we supposed to judge others? Why not? Activities: Make a judge’s gavel. Write what you have learned about God and His judgment on the gavel. Get a piece of wood and write a prayer asking God to help you remove any “specks” you may have in your own eye. God is Good: He has shown His goodness to people in the past and He continues to show His goodness to us today! _____ Monday: Read Psalm 100. _____ Tuesday: Read 2 Kings 4.
woman? How has He been good to you? _____ Wednesday: Read Mark 10:17-31. _____ Thursday: Read John 10:1-18. Think about it: Who does Jesus say He is? Who are we? How does God take care of us? _____ Friday: Read Ephesians 2:1-10. Activities: Make a list of ways God has been good to you. Post it somewhere where everyone can see and remember God’s goodness! Sing “God is so Good”. God is Wise: Not only does He know everything, He knows perfectly how to use that knowledge! _____ Monday: Read Psalm 119:9-16 and Psalm 119:97-104. Think about it: How can we gain wisdom and understanding? _____ Tuesday: Read 1 Kings 3:1-16. Think about it: What did God promise Solomon? How did Solomon respond? _____ Wednesday: Read Luke 2:41-52. _____ Thursday: Read Matthew 7:24-29. Think about it: How can you be wise? _____ Friday: Read James 1. Think about it: What can we ask God for? Will He give it to us? Activities: Memorize God’s word. That is the best way to gain understanding!! Find a rock and decorate it with Bible verses. Let it remind you to build your life on the foundation of God’s word. Only then will you be truly wise! Congratulations! You have completed the Summer Bible Reading Plan! Do something special to celebrate . . . and plan now to continue reading the Bible through the school year! _____ Monday: Read Psalm 90:1-2.
either. He has always been!! your child that God made all of it! _____ Wednesday: Read John 1:1-4.
everything. Draw a picture with your child of his favorite parts of creation. draw a picture in your driveway of what he thinks heaven will look like. _____ Friday: Read Revelation 21:5-7.
a bandage and have him put it on his leg to remind him that he will never hurt in heaven. about what Isaiah saw and how he needed to be made clean before he could serve God. _____ Wednesday: Read Luke 4:33-35.
ways he can use different parts of his body to serve God. Write those ways on that body part. _____ Friday: Read 1 Peter 1:15-16.
didn’t clean themselves! We also can’t get rid of all of our dirt (sin) ourselves. We need Jesus! Discuss this with your child as you clean the windows. he is proclaiming God’s faithfulness to another generation! _____ Tuesday: Read Daniel 3.
someone from your family is thrown into the den! Discuss how God was faithful to Daniel. _____ Thursday: Read Luke 22:42-44.
the cross in the tear drop. Pray with your child, thanking God for being faithful! _____ Friday: Read 1 John 1:9.
sin, but how does our heart get clean again? Through JESUS!! _____ Monday: Read Psalm 29:3-5. _____ Tuesday: Read 1 Kings 18:30-39.
how amazing it was that God was able to cause a fire to come. God is POWERFUL!! story. Talk about how Jesus had more power than the storm and was able to make the storm stop. pretend to be the pigs in this story. For added fun, eat bacon and eggs after reading the story! _____ Friday: Read Philippians 3:20-21.
to be a citizen of heaven. formed him when he was inside of his mom. God knew him then and still knows him now! him to be. God knows him and loves him! felt when Jesus healed him? _____ Thursday: Read John 18:2-5.
outline. Discuss what Jesus did for him while completing the art project. _____ Friday: Read Romans 8:26-27.
for, but God will help us! Help your child pray. having your child say the refrain and shake his instrument every time the refrain is said. with your child, until his interest fades. _____ Wednesday: Read John 13:1-5.
doing this. Turn this into a tickle time if you want! _____ Thursday: Read 1 John 2:3-6. _____ Friday: Read 1 Corinthians 13:4-8.
for ways your child shows kindness and encourage him when he does. _____ Tuesday: Read Genesis 8:2-5.
share how God was showing mercy to Noah by saving him from this flood. that many times and MORE!!! _____ Friday: Read Psalm 51:1-4.
can clean your sins away? Only Jesus! Help your child carve the name of Jesus into the soap. Remind him of this every time he takes a bath and uses this soap. _____ Monday: Read Psalm 46:1-3. To do: Talk about how we don’t need to be afraid because God is in control of everything. of and write these on smaller strips of paper. Have your child glue these strips on the mountain. encourage him to use those phrases throughout the day. _____ Wednesday: Read Matthew 8:1-4. _____ Thursday: Read John 19:8-12.
for our sins. Help your child make a thank you card for Jesus. _____ Friday: Read Philippians 2:8-11.
poster that says, “Jesus is Lord”. _____ Monday: Read Psalm 9:7-8.
everyone, but if we have Jesus, we don’t need to be afraid of His judgment. _____ Tuesday: Read 1 Samuel 3:1-13.
and have him respond how Samuel did. Have fun acting out the story together. _____ Wednesday: Read Matthew 7:1-5.
thanking God for his forgiveness on the piece of wood. _____ Thursday: Read Matthew 25:31-33.
sorting game where you have two different groups of items to separate from one another. (Example: different color marbles). Discuss the passage as you play. _____ Friday: Read Romans 14:10-13.
seat of God. (Example: a throne with a king sitting on it and people standing before the king). musical instrument and play along with the music. _____ Tuesday: Read 2 Kings 4:1-7.
with praises. Then “pour” the praises out and share with others what you praise God for! _____ Wednesday: Read Mark 10:17-22.
away. Bag these and help your child take them to a local charity. _____ Thursday: Read John 10:11-16. _____ Friday: Read Ephesians 2:8-10. _____ Monday: Read Psalm 119:97-104.
than honey. It is good to be wise! To do: Ask your child what he would ask for if he were told he could get whatever he wanted. all of these. Write the word “wisdom” over all the items on his list. To do: Look through a scrapbook with pictures of your child and talk about how he is growing. Talk about how it is important that he grow in wisdom as well as in size! build a structure with blocks and talk about how we need to build our lives on Jesus. _____ Friday: Read James 1:5.
today’s scripture and share how wisdom is a gift. What are some other gifts God gives us? Congratulations! You have completed the Summer Bible Reading Plan with your child! Do something special with your child to celebrate!